A near sellout crowd stayed behind Feb. 19 and cheered as the Gonzaga women each climbed the ladder to cut down a piece of the net. Athletic Director Mike Roth stood at midcourt of the McCarthey Athletic Center as first-year basketball coach Lisa Fortier walked up and cut down the last strand after a record 15-0 run that earned the team’s 11th consecutive West Coast Conference championship. “She made me look like a genius,” Roth said, as he watched. Roth chose to pass the program’s torch to a career assistant after former coach Kelly Graves took an Oregon job in April. Despite some early losses, Fortier led Gonzaga back to the Sweet 16 and out of Graves’ shadow. While Fortier, 33, gave every outward appearance of control and confidence as she led her team into the season, she was anything but on the inside. Fortier and the No. 11 seed Gonzaga Bulldogs (26-7) take on No. 2 seed Tennessee at 4 p.m. Saturday in the Spokane Arena for the NCAA tournament’s Sweet 16. It’s a matchup of a first-year coach versus a program that has made every one of the 34 NCAA women’s tournaments in history and won eight of them under legendary coach Pat Summitt, who stepped down in 2012 with early-onset Alzheimer’s disease. The Lady Vols (29-5) have been led for the past three seasons by coach Holly Warlick, a longtime assistant under Summitt and her 1,089 wins. Fortier was an assistant for all of Gonzaga’s seven-consecutive berths to the tournament, including four Sweet 16s and one Elite Eight in 2011 when the Bulldogs also played in Spokane before falling to Stanford. But she also grew up idolizing former Tennessee players like Chamique Holdsclaw, Tamika Catchings and Kellie Jolly. Fortier coached nine years, in two stints, under Graves and they remain friends and talk often. Fortier said she didn’t really feel like the Bulldogs were her team until after the first game against No. 22 Dayton. The Bulldogs went into the break trailing 33-22. 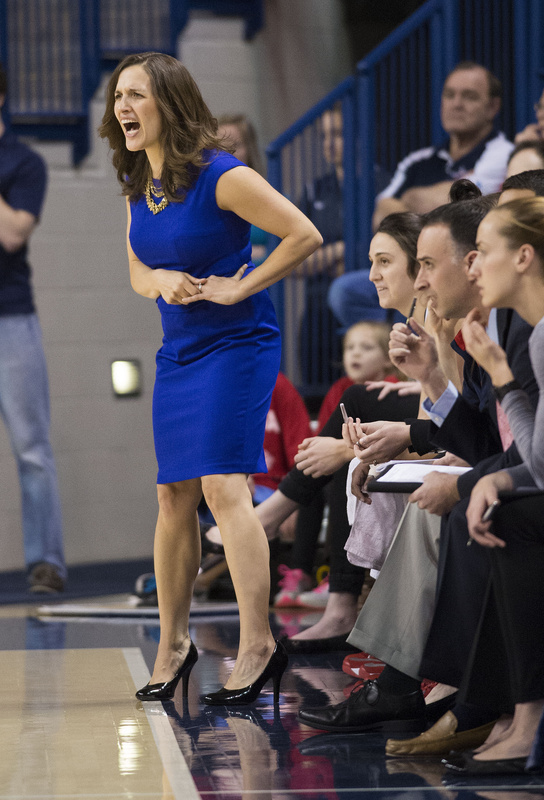 But after the meeting to support Fortier and her staff, Gonzaga exploded for 53 second-half points for a 75-65 win. Along the way, Gonzaga lost games early in the year against American, Iowa, Washington State and Northwestern, as the team adjusted to new guards and the new staff, which includes Fortier’s husband, Craig, Jordan Green and Stacy Clinesmith. Craig Fortier came to Gonzaga after working as an assistant for the Eastern Washington men’s team. After the early losses, Gonzaga ripped off the record 15-0 start to conference before losing three of their last four games and sweating out an at-large bid into the tournament. After two huge wins over No. 6 seed George Washington and third-seeded Oregon State, the Zags have made their own history for a team that is now fully Fortier’s. But the success doesn’t eliminate all doubt. Asked what she would have done differently her first year, Fortier groaned. “Only about a thousand things,” she said. “Every time afterwards, I question whether I should have called this timeout or we should have set that defense. Was I too hard on this player or too nice to this one? I should have kept a list of every little thing I could have done different.